I don’t think it comes as a surprise to anyone who reads my reviews that I love a good dystopian novel. I love the end of the world and what happens next scenarios. Pure presents a dark and dreary world after “The Detonations.” The world is not far from today’s world where the water is contaminated, food is scarce, chemical warfare has left the Earth scorched, and the humans have changed. People are now deformed and have fused to objects during the detonations. "Kids before the Detonations are called Pre and those born after are Posts. Posts should be Pure, but that’s not how it works. The mutations caused by the Detonations settled deep into the survivors’ genes. Babies aren’t born Pure. They are mutated, born with traces of their parents’ deformities. Instead of starting anew, the breeds only seem to get more convoluted, a mix of human, animal, earth, objects. 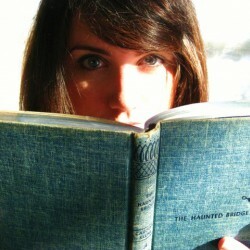 "This book may be labelled as YA, but it’s dark, grim, and gory. There are some pretty dark and gruesome descriptions, and the story reads more like an adult science fiction book than one geared towards a younger audience.I did enjoy Pure, but I didn’t love it. 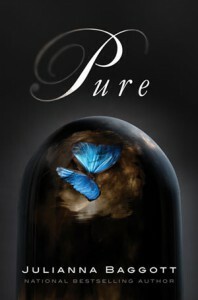 Pure was a very slow paced book. It wasn’t so much that I had a problem connecting with the characters because I didn’t. All the characters were well developed and each had a unique voice. The only character I didn’t connect with was Lyda, but that could because she only had a few chapters. The biggest problem was also what made this novel great. Julianna Baggott creates this fantastic world, but it’s a world that has a lot of backstory. You don’t really get a sense of where this story is going until you are over half way through the book. Sometimes the backstory explanations just took away from the plot line and didn’t help move the story forward.The fusing of body parts to various objects was weird. It made me squirm sometimes yet still was fascinating. The descriptions of each person’s fusing was so detailed it was impossible not to picture. Pressia had a baby doll’s head as a fist instead of a normal hand. Bradwell had birds attached to his back, and El Captain and some women had whole humans latched onto them. There is no way for them to remove these items or people as once they were fused they became part of the host.Partridge and Pressia relationship did not go where I thought it was going to go. I just assumed that this was going to be another love triangle. I definitely look forward to reading more in the next book to see how they develop their unique relationship.